In a large bowl add the heavy cream, sugar and vanilla extract. Using an electric mixer beat for 3-5 minutes or until you begin to see soft peaks. Dice your peaches. Add peaches to a serving bowl and sprinkle a pinch of Florida Pure Lemon Infused Sea Salt. Dollop on top of the peaches a spoonful of the fresh wiped cream. Enjoy! Preheat the oven to 425 degrees F. Put a rack on a baking sheet. Use a mandoline or vegetable peeler to make ribbons from the entire length of each zucchini, as wide as possible (the first few may be too skinny). Make 48 ribbons total (you should get 12 from each zucchini). Lie the ribbons flat on the rack on the baking sheet (it's ok if they overlap slightly) and sprinkle with 1 teaspoon Herb de Provence Infused Sea Salt. Let sit for 10 minutes, then pat completely dry with paper towels. Put the tomatoes in a large bowl and toss with the 1 tablespoon Herb de Provence Infused Sea Salt, 1 tablespoon of the olive oil, and a few grinds black pepper. Arrange the tomatoes cut-side down in a 9-by-13-inch baking dish. Bake until soft to the touch and some of the juices have been released, about 25 minutes. Meanwhile, mix the ricotta, mozzarella, goat cheese, lemon zest, 1 teaspoon salt and a few grinds black pepper in a medium bowl. Lay out 2 zucchini ribbons lengthwise and slightly overlapping, then top with 2 more ribbons crosswise and slightly overlapping, to make a cross. Spoon a heaping tablespoon of the cheese mixture in the middle of the zucchini cross. Tightly fold the zucchini over the cheese mixture one ribbon at a time, alternating between the crosswise strips and the lengthwise strips, so you end up with 1 zucchini square. Repeat with the remaining ribbons and filling. Drizzle with the remaining tablespoon olive oil and season with Florida Pure Sea Salt and pepper. Put the zucchini packs on top of the roasted tomatoes and bake until the zucchini is softened and the cheese is melted, 10 to 12 minutes. 1. Preheat the oven to 350°F. Season chicken with 1 tablespoon salt and pepper. Heat the butter and olive oil in a 3-1/2-quart braiser or deep, oven-safe skillet with a lid over medium-high heat. Add the chicken and cook, turning often, about 10 to 15 minutes or until brown on all sides. Transfer chicken to a plate and drain off all but 1 tablespoon fat from pan. 2. Reduce the heat to medium. Add garlic cloves and cook, stirring, until they start to color (but not brown), about 2 minutes. Add the rest of the salt, white wine and chicken broth to the pan. Bring to a boiling, scraping up the browned bits in the bottom of the pan. 3. Return chicken to braiser, skin side up. Cover the braiser, slide it into the oven, and bake for 20 minutes. Take cover off and bake, uncovered until the chicken is tender and no longer pink (170°F for breasts, 180°F for thighs and drumsticks), 20 to 30 minutes more. 4. Remove chicken to a serving platter and cover with aluminum foil to keep warm. Set the braiser over medium-high heat. If it looks like there’s less than 1/2 cup pan juices in the pan, add enough additional wine to equal about 1/2 cup. Bring the pan juices to a boil while using a fork to mash the garlic cloves, whisking the pulp into the liquid as you work. Add the lemon juice. Whisk in the rest of the butter, 1 tablespoon at a time, until incorporated. 5. Divide chicken among four serving plates and top each serving with some of the sauce and additional Herb de Provence Sea Salt if needed. Sprinkle the parsley/thyme and lemon zest over all. Add all ingredients to food processor or high powered blender. Pulse until mixed. Stop and scrape sides as needed. Perfect for adding to sauces, dressing, breads, sandwiches, pastas, etc. Enjoy! Run the halved lime around the edge of a chilled glass. Place salt in shallow bowl or plate. Dip the rim of the glass in salt and turn to spread evenly. Muddle mint leaves, sugar, and lime juice at bottom of glass. Fill glass half way with ice, add rum and orange juice. In mixing bowl combine banana, chia, honey and salt. Add oats and milk. Stir till thoroughly mixed. Transfer to Mason Jar. Tighten Lid. Open and garnish with desired toppings. Enjoy! Sautee your diced yellow onions in olive oil over low to medium heat. Once translucent, add the chopped garlic and sautee for another 2 minutes. Add your roughly chopped kale and escarole to the pot and bring to medium heat and put on the cover. Let steam for a few minutes stirring occasionally. 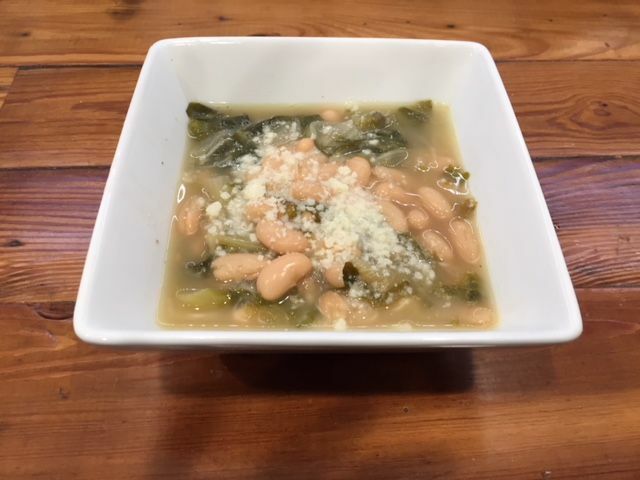 Once greens are wilted, add your hydrated beans or cans of beans along with your chicken stock and water- just enough to cover greens. Added Florida Pure Sea Salt and black pepper to taste. Place lid back on, raise stove to high heat, and bring to a boil. Once boiling tilt lid to release steam and lower temp to low. Cook for another 30-40 minutes stirring occasionally. Serve with Pecorino Romano cheese and crusty bread on the side and share with those you love. Copyright 2016 Florida Pure, LLC. All Rights Reserved.